Last year, The Indian Geek brought out two informative articles on what to look for when buying a camera and the advantages that dSLR cameras have over mainstream point-and-shoot cameras. In the latter article, we discussed all aspects surrounding the sensor sizes of dSLR cameras and why megapixels alone can’t make a better digital camera. We just wanted to revisit this aspect of digital cameras, and inform you of the various sensor sizes out there – so the next time you go out to buy a digital camera, you know exactly what category each of those cameras slot into. Read on for our own take on the five classes of currently available mainstream digital cameras. Yes, five. The size of the sensor is the size of the imaging device that actually captures the photo in a camera. It can’t get any simpler than this – larger the size of the sensor, better possibility for the photo to turn out great. It’s why a 6 Megapixel Nikon D40 DSLR camera churns out better photographs than a 14 Megapixel point-and-shoot camera from any manufacturer. The image above from our article on the advantages of dSLRs depicts the relative sensor sizes of most point-and-shoot cameras (smallest rectangle) with APS-C format DSLR cameras (medium-sized rectangle) and full-frame DSLR cameras (largest rectangle). There are slight variations in the point-and-shoot category, but the general sensor size is the same. The micro four-thirds class of cameras is positioned between the point-and-shoot cameras and the APS-C sized DSLR cameras, while the Nikon 1 V and 1 J series have even smaller sensors, bringing them closer to the point-and-shoot category, as far as the physical size of the imaging sensor is concerned. Sony’s NEX range of cameras are unique in combining a sensor as big as the one found in APS-C sized cameras with a smaller sized body and interchangeable lenses. Just because The Indian Geek told you that bigger sensors take better photos, does not mean that you run out and buy a full frame camera. Owing to the sensor size, full frame cameras are much larger than cameras with APS-C sized sensors. More importantly, full frame cameras such as the Nikon D4, Nikon D800, Canon 1D X and the Canon 5D Mark III cost several lakhs for the body alone. Unless your work requires really high-quality professional-grade photos (or you have plenty of cash lying around), we would not recommend you splurge on a full frame camera. In this class, you have the traditional dSLRs from Nikon and Canon (among other companies) such as the Nikon D3100, Nikon D5100, Nikon D7000, Canon EOS 7D, Canon EOS 60D, Canon EOS 600D and the Canon EOS 1100D. Apart from these, we also have Sony’s NEX series of cameras which are tiny as they do not use the traditional SLR system to take a photograph, but they still utilise an APS-C sized sensor and interchangeable lenses. The Sony NEX series of cameras are a worthy buy, since they are small, easy to operate for beginners and provide the quality in photographs (and better video) that has come to be expected from APS-C based dSLRs. Lenses are costlier and lesser in number, but with Sony releasing more lenses in 2011, that argument is fading. Olympus and Panasonic jointly announced this standard in 2008. Olympus’ PEN series and Panasonic’s Lumix DMC-G series of cameras are some examples. Their intent was to create an intermediate class of cameras between dSLRs and point-and-shoot cameras, with image quality better than point-and-shoot cameras but reduced size and weight when compared to dSLR cameras. Relatively high cost and strong competition from Sony’s arguably better NEX series of cameras have constrained the widespread adoption of the micro Four Thirds format. We’ll just say it outright – we don’t see the need for people to carry point-and-shoot cameras much, any more. Low-end and mid-range point-and-shoot cameras have been seriously threatened by the quality of photographs that modern smartphones such as the Nokia N8, iPhone 4S, HTC One X and Sony Xperia S can produce, and people don’t seem to worry too much about the slight losses in quality or poor low-light performance of smartphones; if the photo is good enough to go up on Facebook, it’s good enough for them. Higher-end point-and-shoot cameras tend to reach towards the Rs. 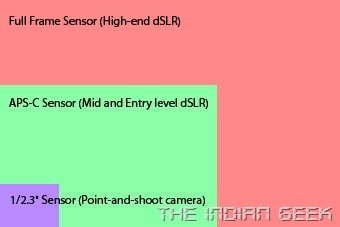 20,000/- mark, which is where cameras like Sony’s NEX-3 are positioned. Though they are tough to be recommended, if you just want a no-nonsense tiny camera that takes pictures and video without much fuss, and are willing to compromise on the image quality for a smaller camera, then you might want to look at point-and-shoot cameras. Even among these cameras, there are differing sensor sizes; make sure you figure out the sensor size of the camera you are looking at, and ensuring that it is best in its price range. We, at The Indian Geek, firmly believe that digital cameras are not a one-size-fits-all solution. Each person has different needs, and a camera that caters very well to one person may not suit your requirements at all. So make sure you know what you need your digital camera for, and make sure you know what all is out there before heading over to your nearest camera store and spending your money on what the salesman tells you “is the best selling camera” on the market. If you have any further information to add/contradict, feel free to use the comments section below.